Michael and Kristin Cary are passionate about leading this generation and the next to freedom from sexual sin. In 2009, while working through his own recovery from sexual addiction, Michael responded to God’s call to serve others facing similar struggles. A former technology industry professional, Michael is thrilled every time he sees a man experience freedom and healing from the slavery he once knew. Michael also loves helping young people walk away from sexual sin patterns that they are developing before they become strongholds, so that they can become fully devoted followers of Christ. Kristin experienced the devastation of sexual betrayal, her marriage ending in 2006 as a result. She found relief and healing in various recovery groups and through working with both a trained counselor and a mentor who had walked this path before her. Kristin feels called and empowered to walk alongside women whose hearts have been crushed by the betrayal of their husband’s sexual brokenness. Kristin served in campus ministry with Campus Crusade for Christ for 15 years before going into full time sexual integrity ministry in 2011. 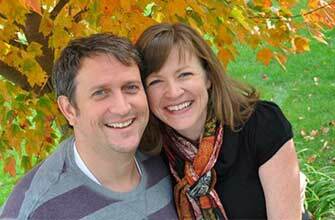 Michael and Kristin live in Westfield, Indiana with their three children. Click here to make a donation to The Carys.